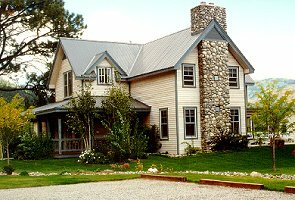 The Apple Orchard Inn, although resembling a century-old Colorado farmhouse, was built in 1994 to be a Bed & Breakfast. In 1996, six quaint cottages were built surrounded by gardens, streams and ponds on 4-1/2 acres. Guests can enjoy the views of the Animas River Valley and surrounding mountains and watch the Durango-Silverton Narrow Gauge Train chug by. Each room and cottage is furnished with elegant furniture and quality linens. Some rooms have fireplaces and whirlpool bathtubs or private patios. A hearty breakfast, including homebaked breads and goodies, is prepared by Celeste and served by husband John. Gourmet dinners are also available with advance reservation and are prepared by Celeste who has European training. This is a wonderful thing to do after a trip on the Narrow Gauge Train, a visit to Mesa Verde National Park, or a day of hiking or shopping around Durango! The Apple Orchard Inn has been fortunate to receive many awards since opening. In 2002, AAA (American Automobile Associations) awarded the Apple Orchard Inn the Four Diamond Award for Excellence, making it one of only three bed and breakfast inns to have this rating in the state of Colorado. The inn is also a member of Distinctive Inns of Colorado. This and other Durango Bed and Breakfast Inns can be found here in The Register. Romantic Country Inns, Getaways and B&Bs offer a great rocky mountain lodging alternative to big hotels.